At Plovdiv’s north terminal, buses large and small depart to destinations throughout central Bulgaria. We managed to find a 16 seater that took us on a three-hour trip to Veliko Tarnovo. The bus was mostly empty, but we did share an interesting conversation with some fellow Aussies, Hugh and Susan, seniors who are full of energy and pursuing business interests in the country. A further three hours at the rain-swept bus stop, where we sat in a small cafe and sipped drinks, munched on hotdogs and chocolate and our jaws dropped at the epic array of beers available for the thirsty traveller. Soon we were on the bus again, and our northerly journey continued, the green landscape slowly levelling out as the road descends in to the flatlands of the mighty Danube valley. We drew into Ruse, whose elegant old town streets are screened by ubiquitous crumbling grey communist-era apartment blocks. A massive TV/communications/surveillance tower stands on a ridge overlooking the city, and, down on the river, the tops of cranes suggest a bustling river-based industry. While Graham scouted for onward bus travel options (Bucharest beckoned in a few days), Prunella was met by Sylvain, a French mechanical engineer, who, with his Mexican wife Elena, have made Bulgaria their home. Sylvain was accompanied by his son, and they provided a welcome friendly face after a long day on the road. The wintry weather was chased away by the warm comfort of the family home in a village not far from Ruse. We shared stories and our boys settled in and enjoyed some time with the large collection of toys. Meanwhile Graham and Sylvain stepped out into the cold evening for a walk a few hundred metres to a quiet reach of the Danube, across green windswept fields, and a guided tour of Sylvain’s workshop, where projects ranging from two Lotus 7 replicas to an array of other mechanical restorations. The next day dawned bright, clear and sunny, and Prunella joined Elena’s weekly shop in Ruse. Later, Sylvain, his son, Graham and Reuben went for a drive into the Rusenski Lom nature Park. This park encompasses the cliffs and gorges of the Rusenski Lom River, one of the last major tributaries of the Danube as it flows on its final eastward journey to the Black sea. We hiked to the top of a long sloping meadow, which drops suddenly away on its opposite side to the sinuous river below. On the slope, among the lush grass and wildflowers, are a strange collection of oddly shaped head stones, bearing odd engravings. These may indicate traces of the Bogomils, a ‘heretic’ fundamentalist sect which emerged in the Middle Ages, and was ruthlessly suppressed by the orthodox powers. Further up the hill is evidence of an ancient trail into the valley, the stones still show cart ruts, perhaps made in by Roman traders. It’s a heady mix. Later we drive back past the Cherven fortress, which dominates the landscape slightly further down the valley. Here Romans and later occupiers built a citadel, long since crumbling into the soil, to control a strategic choke-point on the river bank. Our afternoon ends with some intelligence gathering on train options, and a glimpse at the riverside grandeur of ‘old’ Ruse, which inherits some grand buildings from the 19th Century. Our time in Ruse was a great stop in the comfort of a local family. We shared food and wine and gained a unique perspective on the foreigner living in this quiet corner of the ‘Europe project’. Sylvain and Elena have two children, born in Bulgaria, and so in many ways represent a new form of globalism. We wish them well on their life here. In reality, our five days in Bulgaria are really not enough to gain much insight into this small country, and was always envisaged as a ‘slow transit’ to Romania, rather than a destination in itself. It is a place that deserves a closer inspection, so hopefully we will cross its borders once again. The following day, the sun shining again, we bid farewell to our hosts and entered the grand Ruse railway station, purchasing tickets for the 1430 train to the Romanian capital. A short, red and white train sits on platform 4, and no sooner have we taken our seats (this is Europe, and, even in an otherwise empty train, our tickets are numbered), than the Bulgarian Border guards arrived to stamp passports. This formality out of the way, we are in a moving no-man’s-land until we’ve crossed the river. Soon the chimneys and cranes of latter-day Ruse slip behind us, and the clickety-clack of the tracks give way to the rumble of a girder bridge: below us stretch the half-kilometre wide waters of the Danube. Seriously large barges plod downstream, and the Ruse bank is lined with wharves and cranes. The Romanian shore is less developed, but a thin belt of industry betrays the river crossing’s important position as a transit point for trucks and continuous convoy of EU subsidised agricultural machinery rolling south from German factories into Bulgaria. The river banks give way to a small station where once more the formalities of border crossing are completed, and then the train rolls northward through immense flat fields of green spring crops and bright yellow canola. Like all journeys which are enjoyed, this one is over quickly, and somewhat caught by surprise, we rumble into Bucharest. The city is not large by the standards of some we have visited, and this one features a light and airy terminus-style railway station that betrays the French influence – it is called Gara de Nord (North Station), like its counterpart in Paris. We make our rendezvous with Dinu, our host who has offered his couch for a few days in the city. A very short drive takes us to his building, a dramatic looking converted 1940s merchant’s house. Like many buildings in Bucharest, a vintage exterior opens up to a modern apartment, whose renovation was overseen by Dinu himself. The boys are suffering from cabin-fever, and though the hour is drawing late, we stroll to a nearby park where they can wear off some of their energy among the locals, on some new playground equipment and exercise machines. 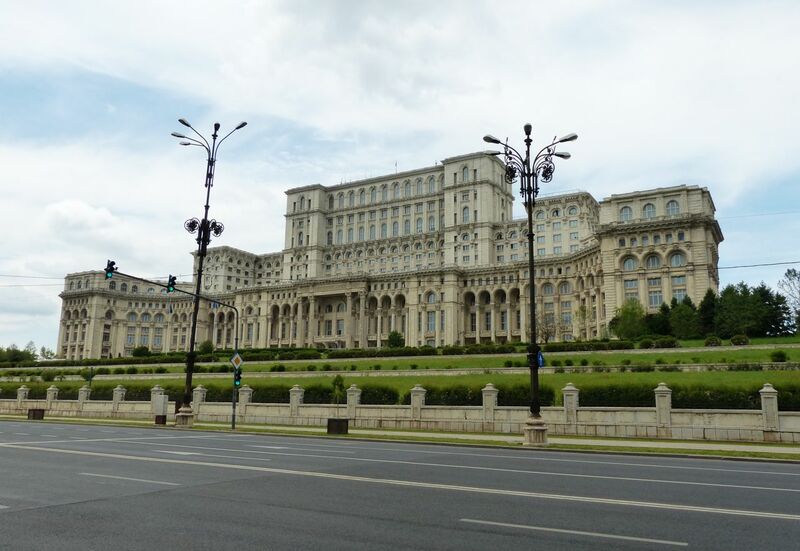 There follows two days of exploring Bucharest, a city which in recent years is re-discovering itself as a destination, rather than a mere transit point. Everywhere, buildings in Lipscani (the old quarter) are being restored to their former glory hosting pubs and restaurants. A large university occupies a central position, providing a youthful element to the population mix, and trams, trolleybuses and innumerable and good value taxis provide transit to all points. Here and there are signs of development stopped by the Economic crisis, but the positives mostly outweigh the negatives and the grim legacy of the fading Ceausescu years. There is very little that is medieval or ancient in the city, Bucharestis are correctly proud to claim the city as the ‘Paris of the East’, as a strong Belle Époque architectural and cultural influence can be deduced. Of course the communist era left its legacy, one of colossal apartment blocks with grubby concrete, and unsympathetic office buildings shoving themselves into the streets alongside much grander constructions. It is said that some of the street frontages were built to deliberately obscure the pre-Soviet legacy of churches, some of which were literally moved out of the way to make room for the new ideology. Hmmm…Make up your own mind. The brutal post-war architecture reaches its crescendo in Ceausescu’s colossal People’s palace, which holds several dubious records for size (it is rumoured to have nineteen levels underneath its grotesque wedding cake block, and though it houses the national parliament, vast spaces remain under utilised. A free city walking tour is recommended: Graham took one and it opened up a new perspective on all this. There is a hidden convent, slabs of ancient wall, a famous caravanserai based on the Ottoman model, and a recent and highly controversial statue of a naked Emperor Trajan on the steps of the National Museum of History. Less arguably, the building which hosted Ceausescu’s final public speech (at which he was famously booed by an angry crowd), is pointed out, along with the monuments which mark the turbulence of the 1989 revolution. A busy week continued as we moved on once again. With Dinu’s help we had bought train tickets for various parts of our travels in Romania, and on Saturday we once more took to the rails. We were pleasantly surprised to find ourselves in a 5-seat compartment on the IR main line service that rolls up into Transylvania, clipping the southeastern corner of the Carpathians which curl into Romania. Our journey finished on the neat, clean platform of Sfantu Gheorghe (Saint George), a small city of 60,000 where we were greeted by Andras, who, like most people in the city, claim a heritage of Hungarian language and culture. Andras practices as a dentist, and shares a flat with Evelyn, his girlfriend near the centre of town. For our first full day, they kindly lent us a car, a solid Renault-inspired Dacia Logan. Experienced couch-surfing hosts, they helped us plan an itinerary capturing some of the highlights, of the region. Our travels led us down the road towards the regional centre of Brasov, which we skirted using a well documented ring-road, making our first stop in Rasnov, one of a series of dramatic fortresses that sit in the Carpathian foothills, controlling the fertile plains below. Further on, an array of car parks and touristic signs told us that were about to join the throng a Bran Castle, infamous as the setting for Bram Stoker’s Dracula, and thus the source of the mythical association of Transylvania with the blood-sucking Vampire. 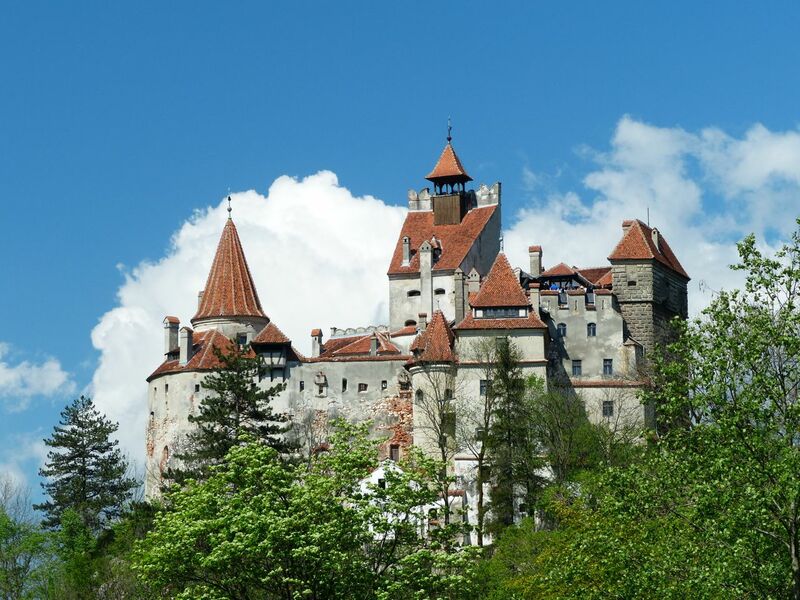 Bran castle – no vampires. Bran’s tourism industry has accepted the misplaced “vampire” myth as part of the castle’s drawcard, and there are one or two information panels describing the life and work of Bram Stoker, the Dracula novel, and the historical figure of Prince Vlad III, upon whom Stoker’s character is believed to have been based. That aside, there is also a good deal of information on the real history of the castle, and a fascinating warren of rooms, stairways and balconies, displaying items form the life of the Romanian nobility who at various times inhabited the castle. Our road finally took us down into Brasov, a city which started as a German-populated city tucked into the base of the mountains, but has spilled out in increasingly recent waves onto the plain. The old city, which consists of some grand streets of 15th to 19th century buildings, surrounding a large square and a brooding gothic ‘Black Church’, said by some to be the largest of its type in south-eastern Europe. The sun sunk over the square, and Sunday strollers headed home, our Sabretoothed chickens among them.